Here at Madhouse Tyres we welcome all account enquiries. We specialise in fleet operations offering businesses a fast and efficient service, including scheduled service checks and tyre management reports. Over the years we have forged strong partnerships with many local companies throughout the South London area and surrounding suburbs, replacing tyres for all types of fleet cars and light commercial vehicles. The mobile service we offer has become more and more popular with our account customers, giving them greater flexibility. At Madhouse Tyres we realise the importance of running a business with minimum amount of downtime so we are pleased to offer an evenings and weekend service. 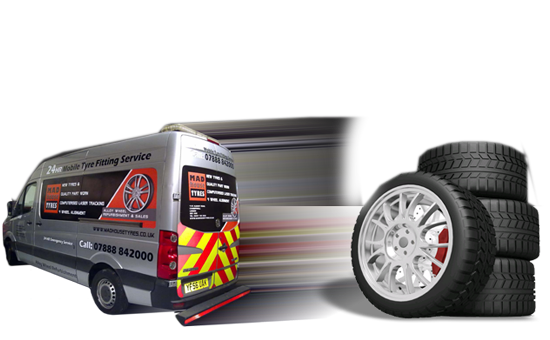 We offer a 24/7 tyre fitting call out service. Our aim at Madhouse Tyres is to help you on your journey as safely and swiftly as possible.